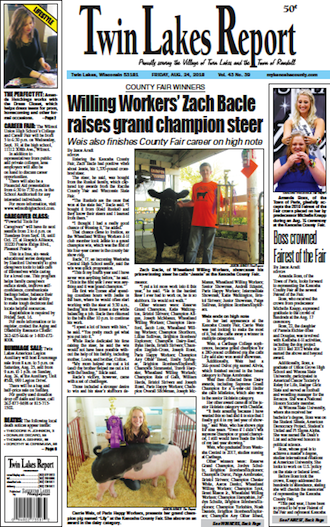 The Kenosha County Fair came and went, but some 4-H members took home awards, including Zach Bacle and Carrie Weis. While Bacle, of Wheatland Willing Workers, raised a grand champion steer Weis garnered supreme grand champion in the dairy project along with a grand champion pig. #LEAHSTRONG: A Trevor girl faces a long recovery after she was struck by a vehicle in Illinois and communities have stepped up to offer a helping hand to family. While she recovers, the mother has extended gratitude to those who have pitched in. CORNFEST: The Village of Twin Lakes saw hundreds of people arrive to Lance Park, where the first annual TL Cornfest was held on Aug. 17. BUILDING WOES: In the Village of Salem Lakes, meanwhile, the board gave an apartment owner one month notice on a property. PERFECT FIT: Two mothers and their daughters continue to pay it forward, offering a free dress giveaway leading up to homecoming. The four plan to hold the event in early September. Meanwhile, in sports, the Report will take a look at how both football teams did in their season-openers and also have a season outlook on the Wilmot boys soccer team.